This new textbook reflects these recent developments while providing a compre- hensive introduction to the fields of pattern recognition and machine learning. It is aimed at advanced undergraduates . . . . .
1 About This course will focus on theoretical aspects of Statistical Learning and Sequential Prediction . 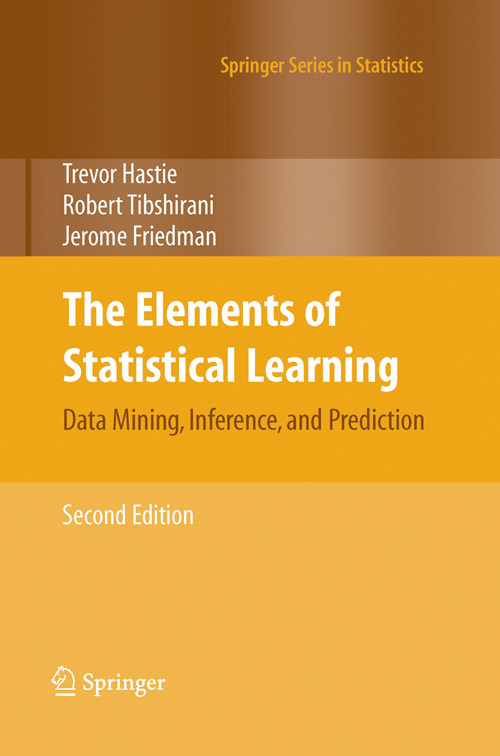 Until recently, these two subjects have been treated separately within the learning c . . . . .
One of the first books in this area— The Elements of Statistical Learning (ESL) (Hastie, Tibshirani, and Friedman)—was published in 2001, with a second edition in 2009. ESL has become a popular tex . . . . . This book is our attempt to bring together many of the important new ideas in learning, and explain them in a statistical framework. While some mathematical details are needed, we emphasize the meth . . . . .
A reflection of our ultimate understanding of a complex system is our ability to control its behavior. Typically, control has multiple prerequisites: It requires an accurate map of the network that go . . . . . The paper presents an introduction to Artificial Intelligence (AI) in an accessible and informal but precise form. The paper focuses on the algorithmic aspects of the discipline, presenting the main t . . . . . Language is a social phenomenon and inherent to its social nature is that it is constantly changing. Recently, a surge of interest can be observed within the computational linguistics (CL) communi . . . . . Deep Learning is a new area of Machine Learning research, which has been introduced with the objective of moving Machine Learning closer to one of its original goals: Artificial Intelligence. See the . . . . .
Quantitative linguistics has been allowed, in the last few decades, within the admittedly blurry boundaries of the field of complex systems. A growing host of applied mathematicians and statistical ph . . . . . This short book was originally written as course notes for a part of a new Software Innovation course at the Department of Computer Science, Aalborg University in Denmark. The students have primari . . . . .
Data Mining: Practical Machine Learning Tools and Techniques offers a thorough grounding in machine learning concepts as well as practical advice on applying machine learning tools and techniques in r . . . . .
During the past decade has been an explosion in computation and information technology. With it has come vast amounts of data in a variety of fields such as medicine, biology, finance, and marketing. . . . . . Robust optimization is a young and active research field that has been mainly developed in the last 15 years. Robust optimization is very useful for practice, since it is tailored to the information a . . . . . This chapter provides an introduction to some basic concepts of epistemic logic, basic formal languages, their semantics, and proof systems. It also contains an overview of the handbook, and a . . . . . Most calculations performed by the average R user are unremarkable in the sense that nowadays, any computer can crush the related code in a matter of seconds. But more and more often, heavy calcu . . . . .